A lot of people will be out celebrating today, drinking beer with limes in the top, shots that include lemon and salt or even supping from a bottle which holds a dead worm. However not many people know the truth about today. When the Titanic set out on that fateful day in April 1912 amongst the large amount of cargo being carried was the first sample jars from Hellman’s to spread news of the product across into Europe, where Heinz had just launched their “salad cream”. The large create of the new product was dully stored deep in the cargo hold on board the Titanic. When the boat sank all the samples were thought to have been lost delaying the spread of Hellmans new product into europe. This delay extended by the fact that the scienteist who created the recipee for the new product also went down with the Ttianic. All was thought to have been lost , then on May 5th 1912 a crate was washed up on a small island just off the coast of Nova Scotia. This caused a huge surge of interest for not only was the create stamped with the fact it had been on the Titanic, but also inside quite unharmed was found many jars of Hellman’s new and thought lost product. A celebration was held that day which has carried on ever since. 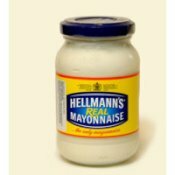 It was called “Sinka de Mayo” in memory of the jars of Hellman’s Mayonase that were thought lost but were returned by the sea.